During the first stages of development of the Parrot AR.Drone - a Wi-Fi, toy flying-machine dubbed, by its makers, a ‘quadricopter’ and controlled by iPhone, iPod touch or iPad, the team in charge of the project turned to Protomold, a service by Proto Labs, for fully-functioning prototype injection-moulded parts. Parrot’s Mechanical & Design Department needed parts with the same mechanical characteristics as those that would eventually be used on the final, production version. As with all flying machines – even toy ones, the strength and weight of components are critical attributes that decide the in-flight characteristics of a vehicle. 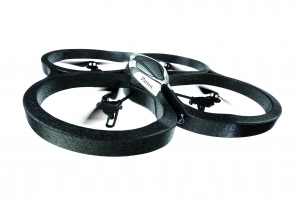 Parrot engineers loaded the 3D CAD models of the AR.Drone components to the Protomold website. A very short while later, the company received an on-line quote incorporating an analysis of the manufacturability of the models and an accurate price for the finished parts. This gives Parrot AR.Drone prototypes characteristics comparable to production parts with the right material, the right colour, the right load and even the injection stress, thus revealing, for example, any weak points: Something that no other prototyping process can offer. Parrot mechanical design engineer Guillaume Savoye says: “We have very much appreciated the technical suggestions proposed by the Proto Labs team for improving the ‘mouldability’ of the object. Our prototypes were delivered very promptly and we were completely satisfied with both the lead times and the quality of finish of the prototype parts. It was particularly important for us to validate the concept with “right material” parts as soon as possible. These enabled us to validate the assembly of the different parts and carry out performance tests prior to production”. The heart of the AR.Drone contains MEMS (micro-electromechanical systems), an accelerometer, two gyrometers, one ultrasound sensor and two cameras, one of which broadcasts and streams what the drone is seeing to the iPhone, the iPod touch or the iPad. The vertical camera, located under the aircraft, is connected to an inertial measurement unit, which enables the quadricopter to perform incredible stationary flights. The front-mounted camera plays a fundamental role in video gaming, using augmented reality technology. For example, it can recognise an enemy AR.Drone for aerial combat between two AR.Drones (as with AR.Pursuit).